Beta axle nut set. Includes both front and rear axle nuts. DOT Approved. Excels on steep hill climbs and tight twisting single trails where the bike needs to change direction quickly. It is sure footed on rocky steep declines and heavy braking situations. Gives superior grip for late braking and tight cornering. 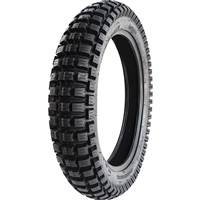 Soft terrain tire that works extremely well in all conditions. Aggressive MX grip with robust enduro construction. Rear is reversable for Soft/wet or Soft/Dry giving a more taylored traction profile for mud or sand/loam. Great for all round enduro, Hare Scramble or MX. The front is reversible for different applications (hard pack or loose terrain). Lite weight MX competition for soft terrain. This tyre has amazing hole shot hook up and solid cornering giving great rider feedback and serious confidence at speed. DOT Approved. If you have a long ride ahead, and you know the conditions will be rough, Tractionator® is the right choice. Tractionator® is designed to handle harder terrain, especially hard trails, desert sand with hard pack variations and fast rocky conditions.. The DNA of a trials tire combined with the dimensions of an offroad tire result in trials like grip with traditional handling.